Blue Throated macaws, Ara glaucogularis , formerly known as Caninde macaws, bear a strong resemblance to the Blue and Gold macaw but are significantly smaller. Blue Throated macaws are more of a Caribbean sea blue-green while Blue and Golds are more of a true blue color. Blue Throated macaws have much thicker, blue feathers on their facial skin patches, where Blue and Golds have smaller, black feathers. Blue Throated macaws have a characteristic large blue bib on their chests and have much narrower faces and beaks than do Blue and Gold macaws. 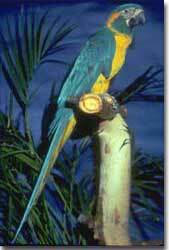 Blue Throated macaws are 34" long with wingspans of 36-40". They originate from the Bolivian states of Santa Cruz and Beni and are quite rare. It is estimated that there are approximately 300 birds left in the wild. Fortunately, they are producing well in captivity. Blue Throated Macaws weigh approximately 650-800 grams. This beautiful macaw is incredibly intelligent and very mechanical. If I were to liken them to a person, they graduated from high school as valedictorians and had full academic scholarships to college majoring in mechanical engineering. Blue Throated macaws love to take things apart. They are total busybodies, adjusting their environment as much as possible to observe what others are doing. Blue Throated macaws are outgoing and acrobatic, and are often seen hanging by a toe from a toy, a swing or someone's finger. They can be pushy and test you; you are their best friend if you can meet them on their own terms. Blue Throated macaws love to wrestle and be physical; in addition, they can be "beaky" but don't usually bite hard. They can be intimidating with their beaks, and if you allow them to intimidate you they can become dominant and bite hard. They are fun loving, are always looking for a good time, and are forever trying to manipulate those around them. We are not currently breeding our Blue Throated macaws, but hope to resume breeding them soon.